Apple's latest event prominently outlined new iPads, but also focused attention on Apple's now third place but still strategically important Macintosh business, including the new Mac Pro desktop and revamped 13- and 15- inch MacBook Pro notebooks. 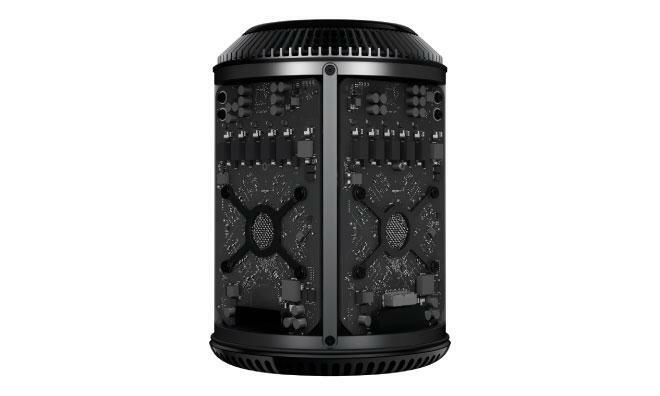 After first teasing its newly redesigned Mac Pro (above) in spots starting this summer, Apple provided the first real details of component specs and prices this week. As expected, they are not aimed at consumers, with the base price starting at $2999 and a second tier opening at $3999. Every aspect of the new machine targets the needs of creative Mac professionals. Unlike conventional PCs that plug a series of components into logic board fit in an open box with room for expansion bays and slots, the new Mac Pro has an innovative industrial design that rethinks the entire concept of desktop computing by looking at the current state of computing afresh. 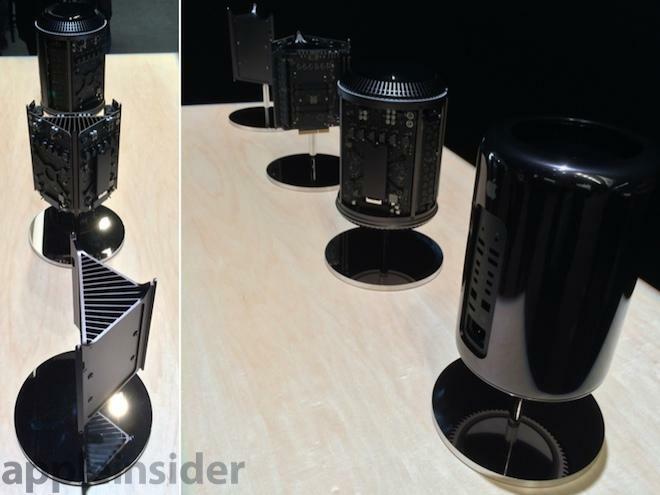 Apple detailed the new Mac Pro's design process in a video it presented at its event earlier this week (below). Apple's head of operations Jeff Williams explained, "To make a product as advanced as the Mac Pro, we had to pioneer entirely new processes." As AppleInsider outlined in April, the new Mac Pro gets rid of not only optical drives but also mechanical hard drives for booting and storage, shifting instead to solid state flash storage just like the MacBook Air (albeit a high performance variety). This allows Apple to drop both drive bays and the disk-oriented SATA interface, as the Pro's flash storage uses PCIe directly, essentialy being plugged right into an expansion slot without an intermediary disk interface. But the new machine also gets rid of PCIe slots themselves, instead accommodating external expansion via Thunderbolt, which is essentially PCIe in the form of a cable. That allows for an extremely compact unit that concentrates a workstation class CPU (Intel Xeon E5, available with 4, 6, 8 or 12 cores), two AMD FirePro GPUs (each packing 2-6GB of VRAM), and up to 64GB in four DDR3 ECC RAM slots along with a power supply into a cylinder with a 6.6 inch footprint that's smaller than the 7.7 inch Mac mini. 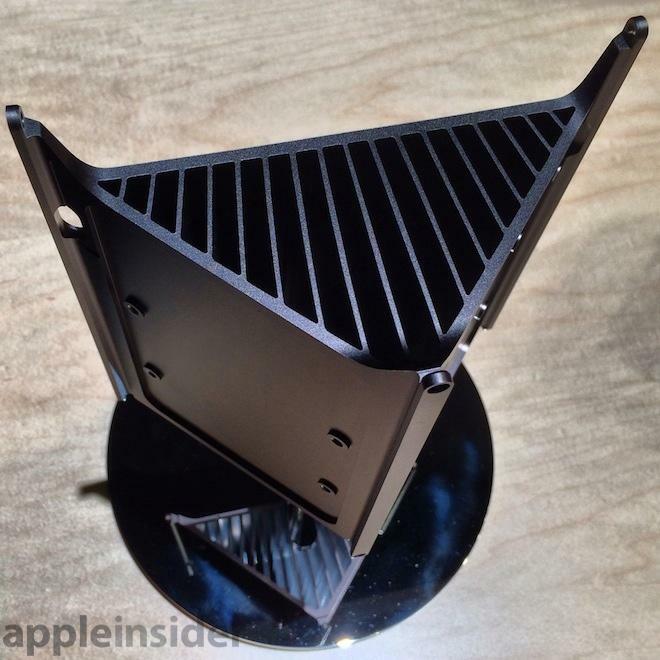 At 9.9 inches tall, it's 1/8 the volume of the previous Mac Pro tower. 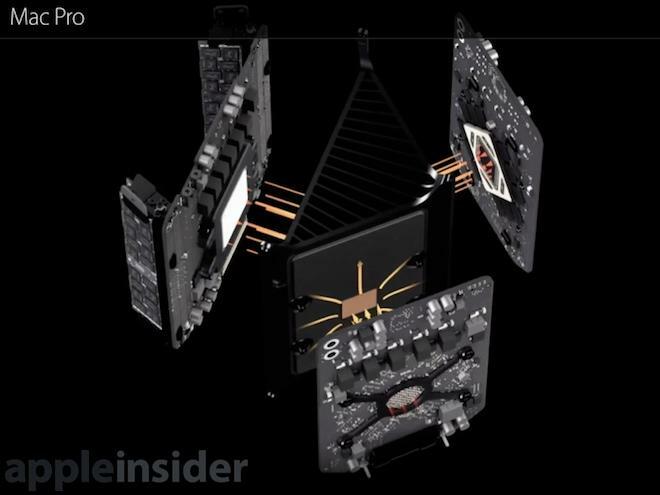 The key to the Mac Pro's dense, compact design is its innovative central thermal core: a triangular wedge of aluminum with internal ribs that function as a shared heat sink for the three primary processors, which are attached to each side. The two GPUs are attached on either sides of the isosceles triangle, fit onto boards that screw into the thermal core and expose the chips via thermal paste to it, so the heat they generate can be quickly absorbed into the core. The hypotenuse side gets the larger Xeon attached to it in the same way. Mounted upright, this allows a relatively slow fan mounted on top to pull air up through the thermal core and evacuate it out the top, assisted by the natural upward thermal convection. 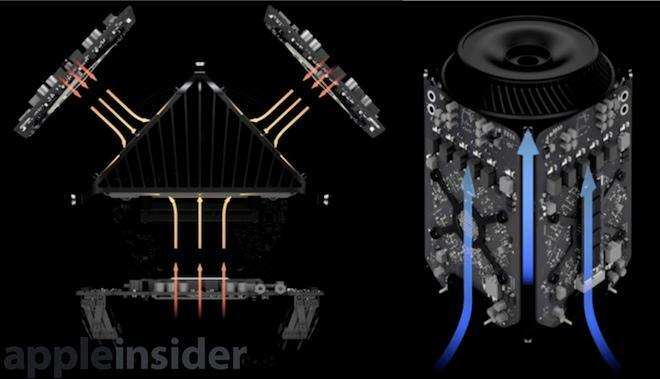 Apple's designers in the hands on area explained that about half of the airflow pulled through the machine goes up through the core, while the other half circulates around the plenum space surrounding the core within the Mac Pro's external cylindrical tube. The remaining area in front of the Xeon CPU accommodates the RAM slots and the external ports. There are four RAM slots that accommodate up to 64GB total using standard 1866MHz DDR3 ECC parts, driven by a four channel memory controller delivering up to 60GB/s of memory bandwidth, twice that of previous Mac Pro systems. The flash storage unit (which like the iMac is proprietary to Apple and not considered user serviceable) attaches to the surface of one of the GPU board sides. In the current design, there's only one connector for an internal flash storage device (depicted below, without the flash unit installed), with options ranging from 256GB to 1TB. Powered by a PCIe controller that can deliver up to 1200MB/s, this flash storage is much faster than a typical 500MB/s SATA flash SSD or a SATA 7200 RPM hard drive running at 110MB/s. All additional storage is connected externally, via either the Mac Pro's four USB 3.0 ports, six available Thunderbolt 2 ports, or using the dual Gigabit Ethernet ports via Network Attached Storage or a Storage Area Network. In addition to supporting external storage and expansion (including pro audio interfaces), each 20Gb/s Thunderbolt 2 port can support up to 6 devices in a chain, for a total of 36. In addition to delivering PCIe, Thunderbolt also carries DisplayPort signals, offering support for up to three 4K Ultra HD displays or six standard Thunderbolt displays. In addition to a fast, multiple core Intel CPU, the Mac Pro makes dedicated use of one GPU for driving video displays while the second is reserved for computing, from audio and graphics processing to scientific number crunching or 3D rendering. 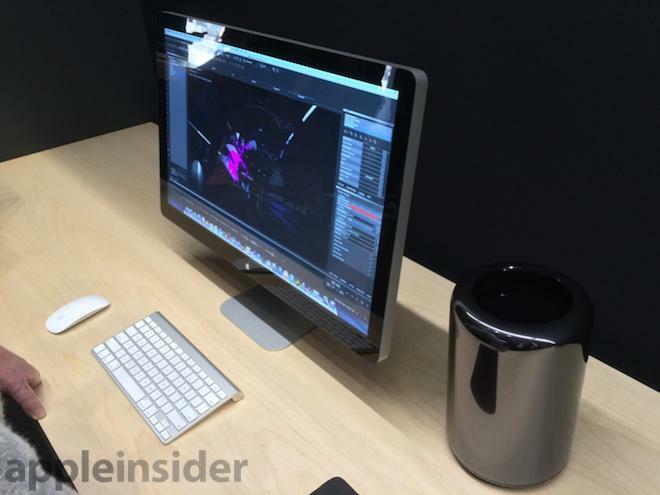 Apple directly pitches its new Mac Pro at video editing, 3D modeling and animation, photography, graphic design, audio, and science and technology professionals. With support for both OpenGL 4.1 and OpenCL (which drives computationally intensive, general purpose tasks on free GPU cores), the dual standard FirePro D300 to D700 GPUs deliver up to 7 teraflops of computational muscle, workstation class graphics power with capabilities and computational accuracy well beyond the typical higher-end consumer, Radeon-style GPUs designed primarily for playing video games. The new machine is expected to become available in December, and will be accompanied by new versions of Apple's Aperture, Final Cut Pro and Logic Pro tuned to take special advantage of it.